It’s well known that tectonic plates can slip underneath another plate in subduction zones and that violent earthquakes occur when the plates stick and release. 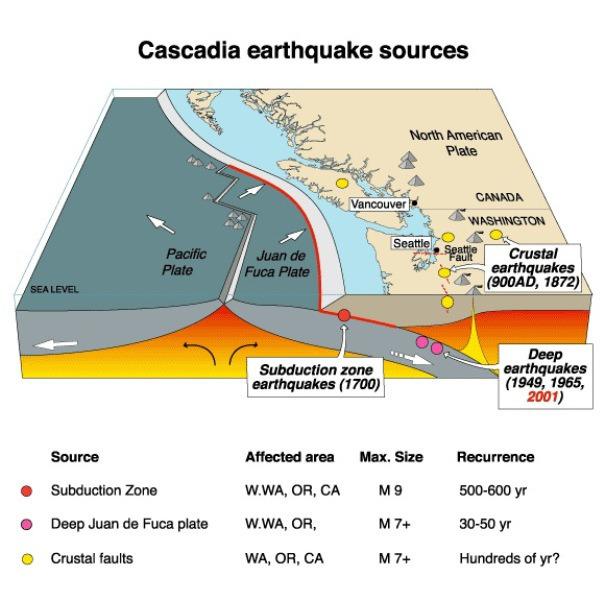 Research is revealing the frequency of potential earthquakes. If it weren’t for ‘lubricated’ sliding, British Columbia would have a major earthquake every fourteen months and Japan every six. I’m not sure whether the lubrication is from melting rock or from seawater or a bit of both. Canadian scientists are being muzzled by the Conservative Reform Alliance Party government, which refuses to let them talk about their research without vetting all statements first. This has a chilling effect on research, as the free exchange of information is crucial to coming to the correct conclusions. It also deprives Canadians of knowing what their tax dollars are paying for and the verified facts that they could use to make decisions with. VANCOUVER—As thousands of researchers gather in Vancouver for an international conference, focus has turned to the Canadian government and concerns that federal scientists are being muzzled from talking about their work. A panel discussion at the American Association for the Advancement of Science meeting heard that federal scientists — including those at Environment Canada, the Canadian Food and Inspection Agency and the Department of Fisheries and Oceans — are doing top-line research that’s being published in some of the most prestigious journals. But the Canadian public isn’t aware of this work because scientists have been told not to talk without getting clearance through layers of bureaucracy in Ottawa. “Scientists are first and foremost a public servant, not a servant for the ministry,” said Andrew Weaver, a climatologist at the University of Victoria. A policy change in 2008 said federal scientists must direct all media inquiries to national headquarters and not respond to requests to talk about their work. Francesca Grifo, director of the scientific integrity program with the New York-based Union of Concerned Scientists, said scientists must be allowed to speak about their work so that the public can stay informed about research being done to safeguard water, protect the environment and ensure pharmaceuticals are regulated. “We can’t manage without information,” she said Friday. Last year, Kristina Miller, a Department of Fisheries and Oceans scientist who had her research published in Science, was told not to talk to the media. On Friday, seven groups including the World Federation of Science Journalists and the Canadian Journalists for Free Expression sent an open letter to Prime Minister Stephen Harper citing another example of an Environment Canada scientist being prevented from talking about his ozone layer research. “Clearly Canadians have the right to learn more about the science they support and to have unfettered access to the expertise of publicly funded scientist,” said the letter. Faced with staffing cuts, the 23,000 federal scientists are operating in a culture of fear, said Johanne Fillion, a spokeswoman with the Professional Institute of the Public Service of Canada. Yet another organization proves to have feet of clay. The CBC’s Fifth Estate found 340 children abused by active scout leaders. There are many fine leaders in Scouts Canada. But child abusers go where the children are. A few scattered specimens of spotted bats have been found in B.C., north of where they were previously found. They are at risk, of course! A deranged spammer of religiously based death threats has been charged with two counts–perhaps the most recent and local of his offences? Or perhaps the most vicious? Those with the youngest victims? Who know? At least the Montreal Police were shamed off their duffs by the blaze of publicity shone on them by an online petition. He wasn’t lured into threatening the police. I don’t think anyone expected that he would start threatening them, but he started signing the petition himself in order to place threats against other signers in the comments. Which sent his threats straight to the police. Then his habit of choosing “Reply All” for anything that mentioned him meant that his Tweeted threats against people discussing him also went to @SPVM, the Montreal Police. The Montreal Gazette reports that Montreal Police have finally been motivated to start an investigation into tens of thousands of death threats sent by one man who calls himself David Mabus and who uses hundreds of e-mail accounts, twitter accounts, and forum IDs to send pre-written death threats to skeptics and atheists. Hate speech, anyone? International death threats, anyone? “Mabus” apparently takes religion as his excuse to issue threats of torture and decapitation. Tim Farley, a computer-security expert in Atlanta, Ga., told The Gazette that, “as instructed” by Montreal police, “I filed a report with the Atlanta police on this person in January  when he first started sending me direct death threats.” Farley said he also faxed that report – on Feb. 10 at 3:43 p.m. – to Station 7 in St. Laurent, the station nearest to where the man apparently lives and works. “Today (Wednesday [Aug. 10]) was the first time anyone from the police has ever called me,” Farley added. [Montreal police spokesperson Lt. Ian] Lafrenière said he was not aware of earlier complaints to police about the man’s activities…. Lafrenière said he wasn’t aware of any complaint from [UMM Prof. PZ] Myers. Prof. Myers filed at least one formal complaint in 2009. A Montreal man who uses the name David Mabus, and who has been identified as Dennis Markuze of Saint-Laurent, Qué., has allegedly been issuing death threats to American science journalists and bloggers over the course of the past three years, first by email and lately via twitter. However, despite repeated complaints to the Royal Canadian Mounted Police (RCMP) and Montreal City Police (SVPM), no action has been taken. Read the rest at Rutherfield Mansfield’s site .